Bring on another mildly humerous read in the form of an internet dating agency. While I wouldn't say this is the best thing I ever read, I will say that the characters were actually amusing. Sierra Kent owns the agency. Belle Adamson is her best friend and local beautician. Olivia Fairley is newly engaged to Sierra's "Uncle" Hank Stevens and Marc Fairley is Olivia's son. He's in town to stop the wedding and to secretly check out a future acquisition, The Love Byte Dating Agency. Marc is extremely annoyed that his mother has moved to the country to marry some guy that he thinks is only after her money. Hmmm...can you see where this is headed yet? Throw in a quirky cafe owner, Cythera (affectionately known as Cy), who has a penchant for dreadlocks and crystals; Rob Alden, Marc's cut-throat business associate; Aussie-broad Flo, owner of The Love Shack Diner; William Jamieson, Marc's right hand man around the house, and don't forget Ripley, the dog! While I didn't find anything really exciting about the story, there were a few moments that brought a chuckle or a smile to my face. Oh...and there just might be a little something revealed too! 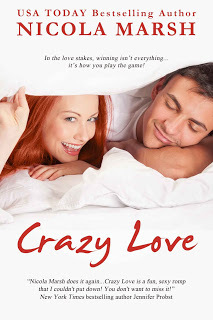 Crazy Love by Nicola Marsh is an easy read over a weekend or a several nights during the week.